Just when I think my fifteen minutes of fame are done from I HAS A BUDGET and 2.0RLY, the Fame Stick hits me in the face for yet another fifteen minutes, this time in the form of PANDORA ARE SERIOUS CAT getting into I Can Has Cheezburger. Thanks to konolia for the Metatalk mention; I had removed ICHC from my feeds during an internet pruning about a month prior, so I’m not sure I would have noticed otherwise. By the way, the books in that photo are Working For Yourself and The Barbarian Conversion. The ink wash drawing in the background is by my wife. 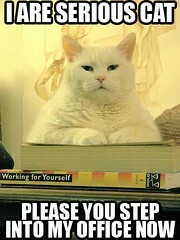 You may also wish to see the original “I are Serious Cat” macro. You can has congrachulations! Hey…you never told me whether I could borrow that Pandora pic that I wanted to submit….